PMI Graduated at Budapest 22 New Leaders Coming from 13 Different Countries! Reported by PMF Correspondents Theofanis Giotis and Alcides Santopietro from Budapest, Hungary. After one year of activities, three face-to-face sessions - in Madrid (Spain), Warsaw (Poland) and Budapest (Hungary) - and three teleconference meetings, the participants experienced a program similar to that which leaders of globally recognized companies receive. The PMI LIMC initiative, part of PMI’s strategy to form leaders worldwide, is one of the many opportunities that PMI provides to develop the professional career of its members. PMI LIMC participants, after passing through a strict selection process to be part of this group, now have the skills necessary to transform PMI, themselves and their professional organizations. This was PMI’s first program taking place outside North America and the cultural variety was remarkable: the participants come from 13 different countries from all over the globe with 6 business owners among the participants. 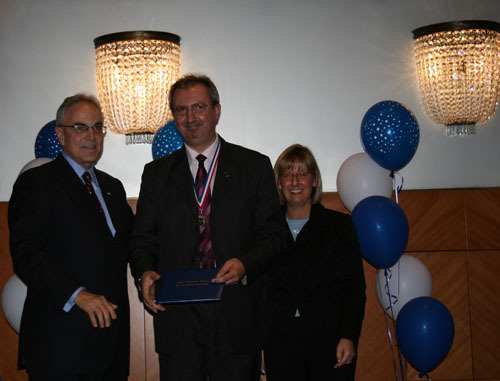 The graduation ceremony took place at the Intercontinental Hotel in Budapest, Hungary, during PMI’s Leadership meeting on May 11th, 2007. Mr. Greg Balestrero, PMI’s CEO and Mrs. Linda Vella, PMI’s elected Chair of the Board, congratulated all graduates encouraging them to continue “the journey of self-discovery and leadership development”. “Demystified some notions of leadership, confirmed a gut feeling: a leader is an altruistic motivator who can transcend management and can focus others’ energy. The sooner you see yourself in this ROLE, the less you’ll be impatient to be just nominated in a position”. “To all future leaders: PMI’s LIMC is the ultimate journey of self awareness. Once you master this skill, you will be prepared to lead at the next level”. “The many different cultures and experiences brought in by each individually provided a fertile ground for my journey of self-discovery and empowerment where I now have a personal vision and a good understanding of myself and others. 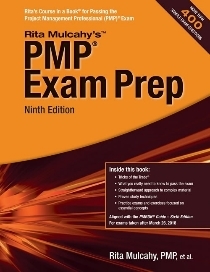 The LIMC Class is an excellent preparation for taking my next step in leadership in the PMI organization”. "I used to believe that leadership could be taught. Now, after LIMC, I know that leadership could and should be taught to everybody within organizations and within PMI network”. “I am convinced that a true leadership culture within PMI and its Chapters is crucial to win the fierce competition for the time of our volunteers who help to provide value for PMI’s members. I am fortunate to be part of this Master Class”. “Volunteering for PMI has enriched and enhanced my career. The leadership master class has given me additional tools I’m certain will help me become a more effective leader”. “This experience empowers me to take responsibility for my role as a leader and help others to achieve their full potential. I feel very grateful for the relationships I have built and I am eager to move forward with this newfound knowledge”. “The LIMC can be a scary experience. You will learn things about yourself that should have remained a secret. You will learn to better understand others: a scary thought. Confused you will become. But the force will be with you and in the end you will become a better leader”. “The Dutch group used a soccer related quota to describe the experience in LIMC: ‘Every advantage has an disadvantage.’ I would like to add another: ‘After the game is before the game,’ meaning that leadership is based on never ending willingness to reflect your own role as well as the reasoning of others to act the way they do”. “I found this course a valuable journey of self-discovery and an excellent forum for networking with PM leaders / volunteers from all over the world”. “LIMC 2007 was the greatest leadership learning experience in my life. If you have a future opportunity to participate, please do”. Other participants are: Nathalie Collautt (USA), Deena Gordon (Turkey), Jean Gouix, (France), Pan Kao (United States), Yan Bello Mendez (Spain), Brenda Ellen Treasure (Australia), Robert Hierholtz (France). and Daniel Tuten (USA). 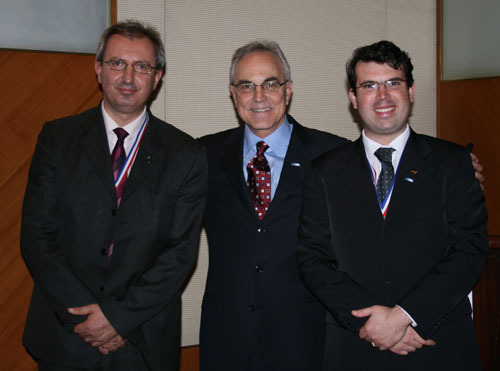 Mr. Greg Balestrero, with Mr. Theofanis Giotis and Mrs. Linda Vella, PMI's President during the graduation ceremony!